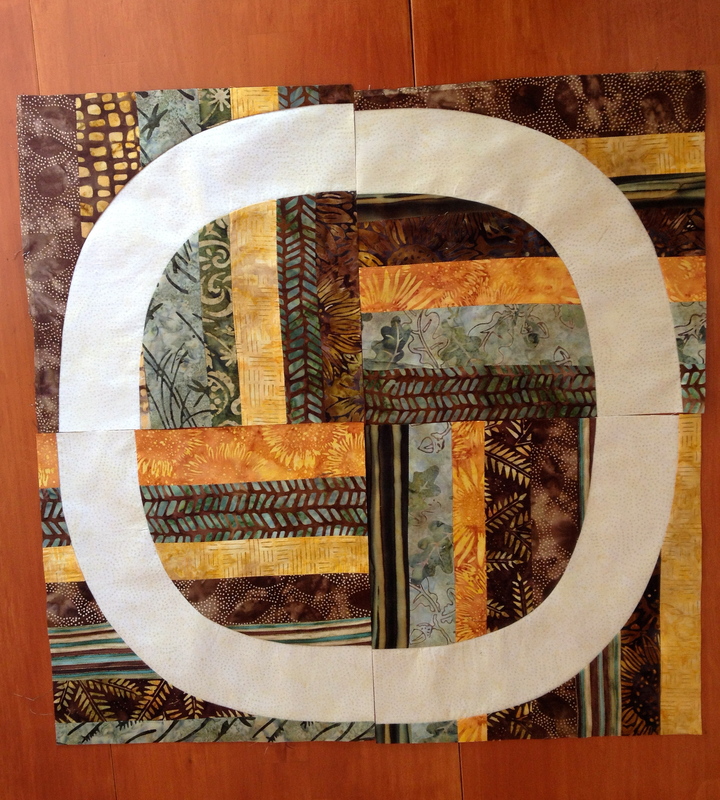 ← A Single Girl Quilt for my Married Girl? 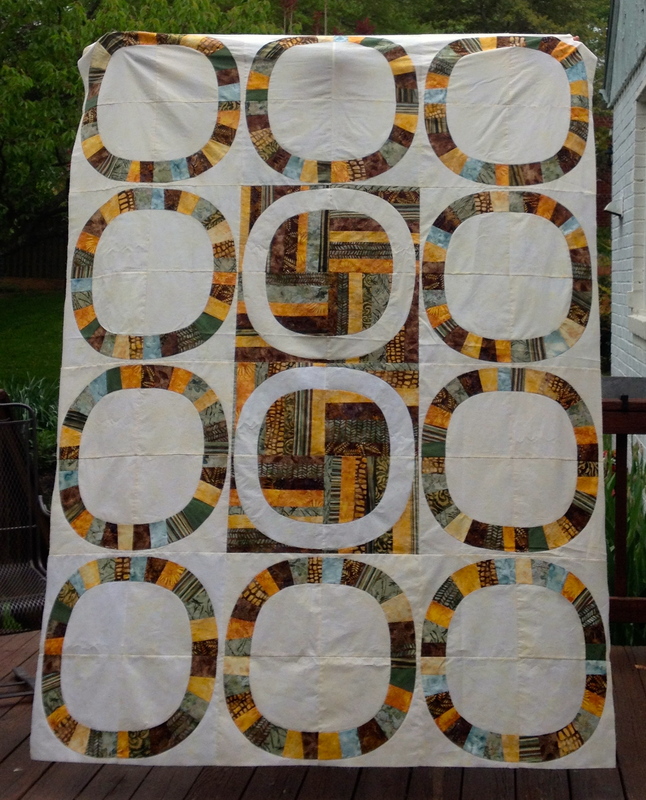 To find out more about the design of this quilt, please read my last post. I am making it for my married daughter and her husband and it is made from fabrics that were used as pretty fall napkins during their wedding reception. It seemed to take me forever to make those center two blocks. I strip pieced the fabrics and then laid them all out in order to make sure that I cut them right to get the alternating striped pattern that I wanted. I was very careful to pick up each one and orient it the right way when I cut it so that it would form this pattern when I sewed it together. I did this meticulously for all 8 blocks and then I took them to the ironing board to press them, and guess what? They all looked the same! I felt so stupid! How did I not realize that I could have just simply laid them all out in the same direction and I would get the same pattern? 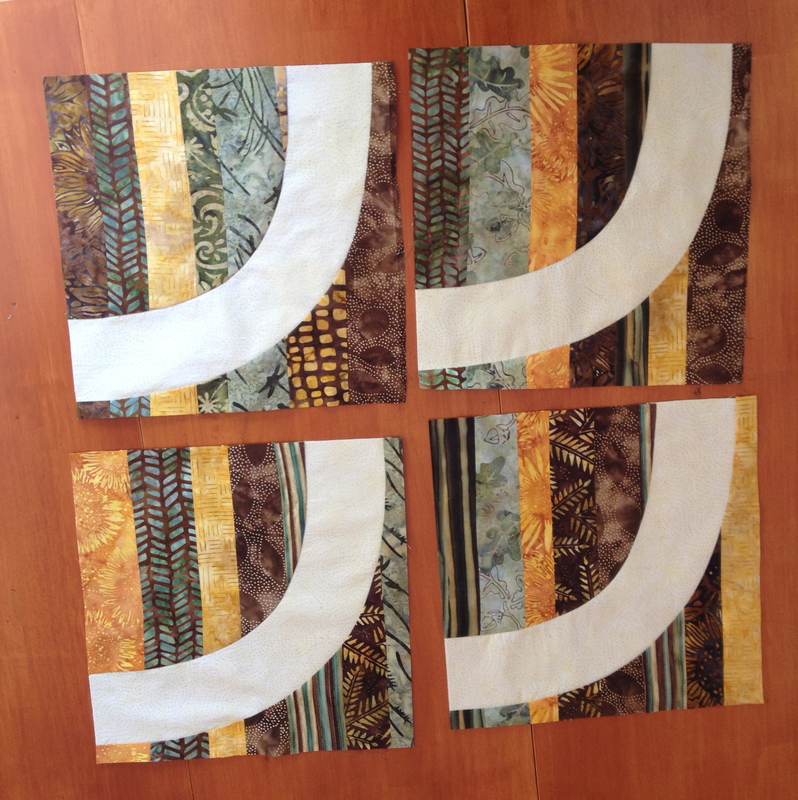 It was a breeze to sew the 12 large circle blocks together once these middle two were together. I’m really happy with the result. 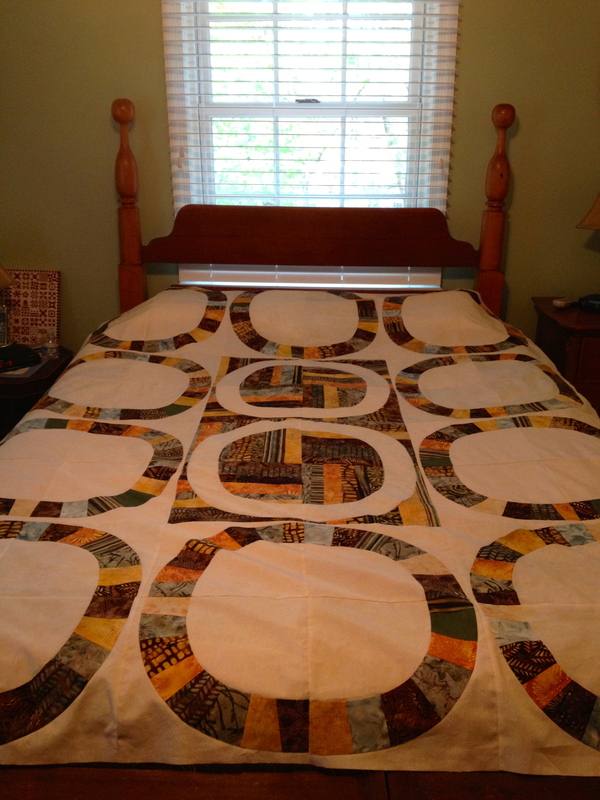 Here is how it looks laid out on my queen size bed – it’s only meant to be a lap quilt, but a big one! Next is making up the back. I’ve decided to simply sew the napkin squares together. Circles on the front and squares on the back. Napkins set out on my design wall. I will have to put a border around these as they are smaller than the blocks on the front. I’m in the process of trying to wash the cotton batting I am going to use to eliminate shrinkage when the finished quilt is washed. Most of the time I love that “crinkly” look when a quilt is washed for the first time. 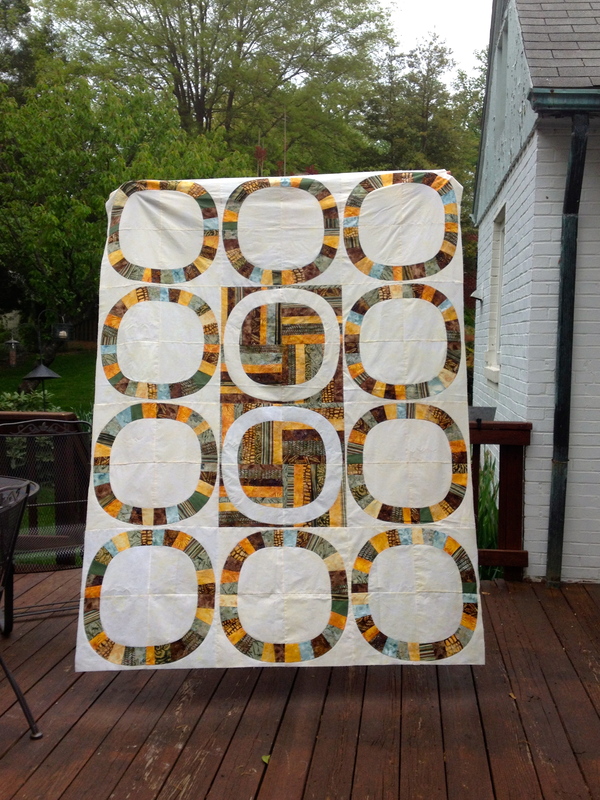 However, with this quilt having such a large design, I think it might be better if it lays more flat. If the batting survives the washing and drying process, I guess we’ll see. 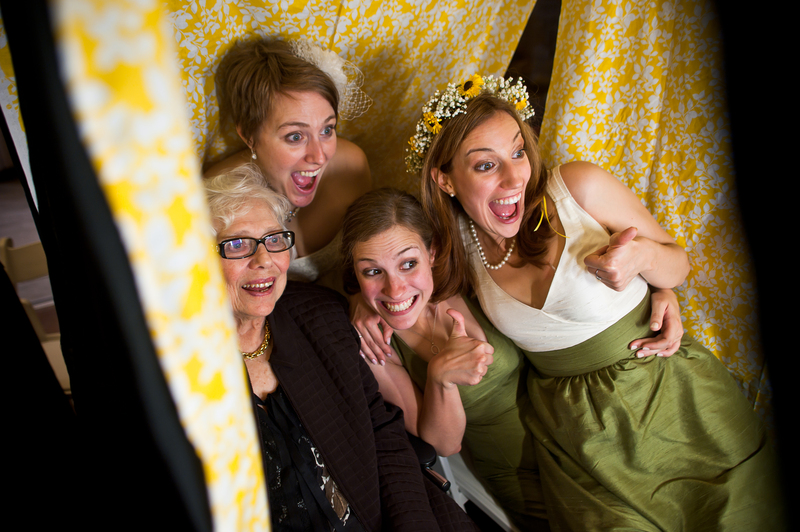 The groom made the photo booth. It was so much fun. 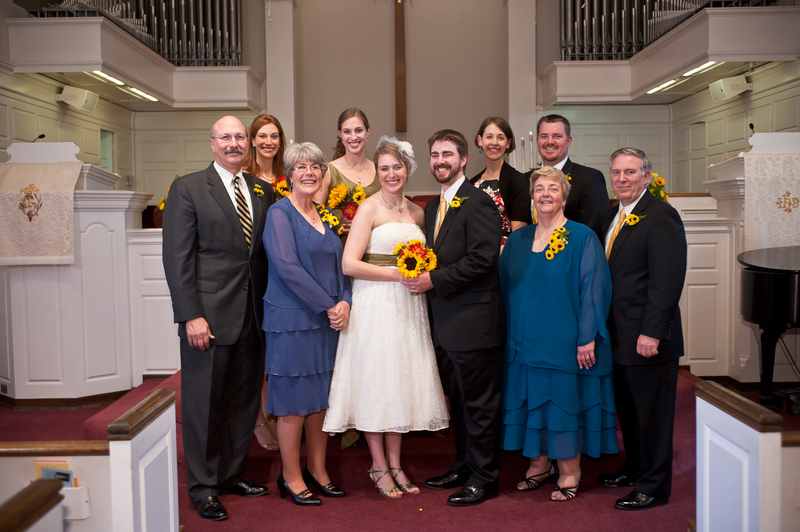 It was a remarkable day and the two families have blended together perfectly. If we lived closer together (we’re in DC and they are in IL), I’m sure we would be good friends. As it is, we have great fun when we do get together. The quilt looks great. Really enjoyed seeing the family photos- three beautiful girls! 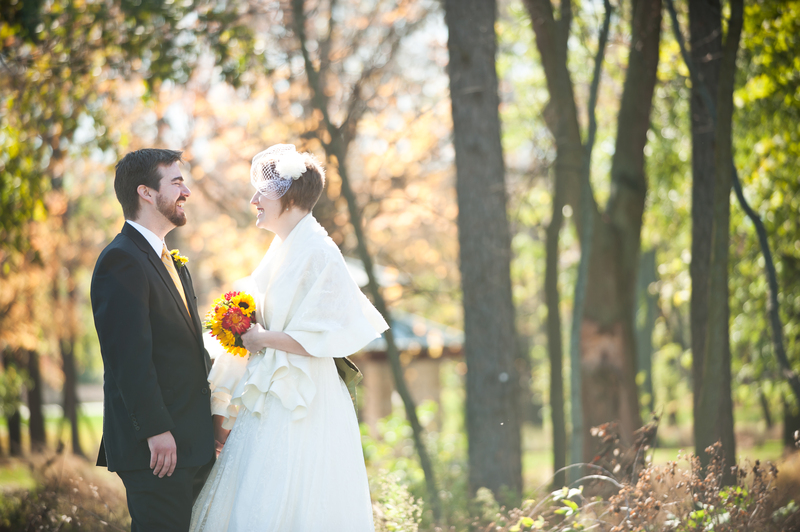 The quilt is gorgeous, and I just love the idea of using napkins from their wedding! Thanks Lexi. You wouldn’t believe how many more I have! The quilt is beautiful in the photos and in person! 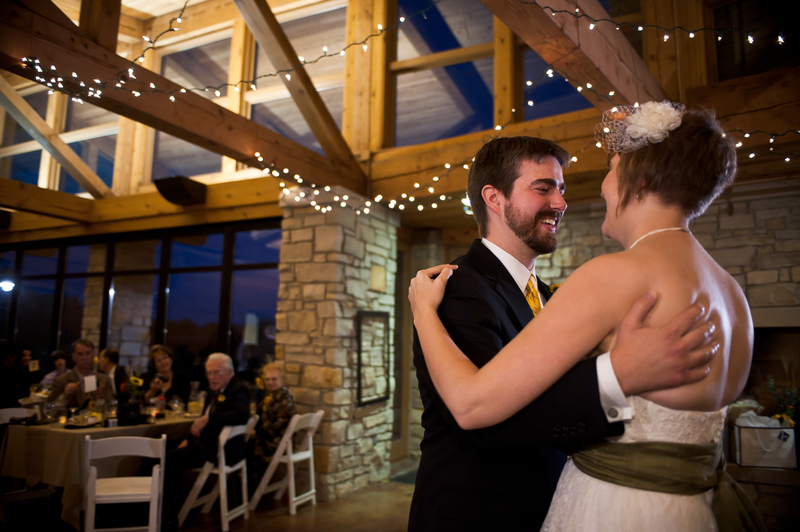 Great pics from the wedding too! It is beautiful and looks so pretty on the bed. She may not want it on the couch! Please be advised, that to ensure compliance with requirements imposed by the Internal Revenue Service, any tax advice contained herein, including any attachments, was not intended or written to be used, nor can it be used, for the purpose of avoiding any tax penalties that may be imposed under the Internal Revenue Code. This e-mail and any files transmitted with it are confidential and are intended solely for the use of the individual or entity to which they are addressed. If you are not the intended recipient or the person responsible for delivering the email to the intended recipient, be advised that you have received this email in error and that any use, dissemination, forwarding, printing, or copying of this email is strictly prohibited. If you have received this email in error, please notify us immediately by email and delete the original message. 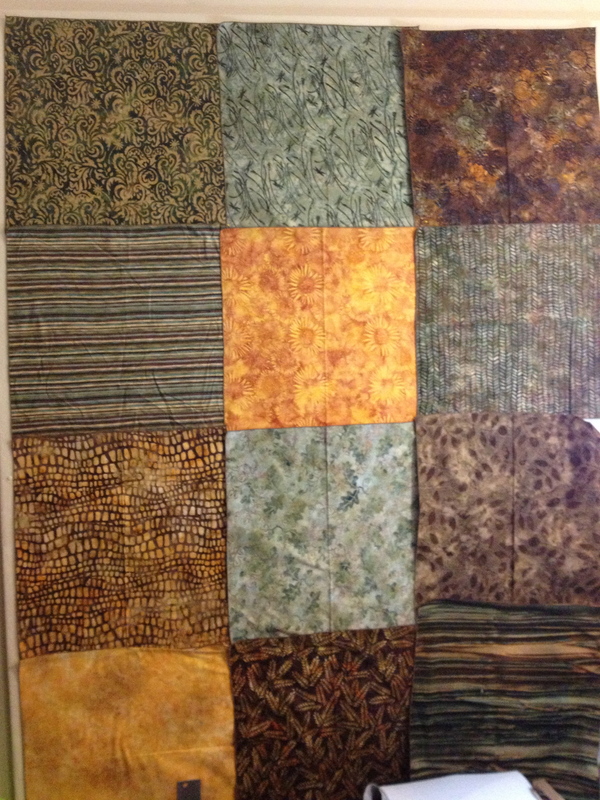 I am enjoying watching the progress of this beautiful quilt. They will love it.